Straight Talk host André Hakes talks with Terry Cooper from OneVirginia 2021 about gerrymandering issues in our state and what OneVirginia is doing to make our voting districts ours. Can Virginians Pass a Constitutional Amendment Ending Partisan Gerrymandering? CPN Original, Politics, Senior Center in Charlottesville, Senior Statesmen, Speeches and Presentations Comments Off on Can Virginians Pass a Constitutional Amendment Ending Partisan Gerrymandering? The work of Congress has largely ground to a halt. It seems to be unable to address the problems and opportunities we face in a meaningful way. That same gridlock seems to be invading our state legislature more and more. Leigh Middleditch and Terry Cooper are part of a group that’s trying to do something about that. OneVirginia2021: Virginians for Fair Redistricting, is a nonpartisan group that believes that a major cause of our legislative gridlock is partisan gerrymandering, the drawing of legislative districts’ lines for the purpose of partisan advantage. OneVirginia2021 is seeking to amend Virginia’s Constitution to take that power away from the legislators and delegate it to an independent, nonpartisan commission of Virginia non-politicians who will have to draw the district maps in strict compliance with common sense, nonpartisan standards — like respect for city, county and voting precinct boundaries, compactness and contiguity. Leigh Middleditch (Left) and Terry Cooper speaking at the Senior Center in Charlottesville. Terry Cooper does political research, principally opposition research for Republican candidates. He is a graduate of Episcopal High School, Princeton University and the University of Virginia School of Law, where he was research editor of the Virginia Law Review, a member of the National Moot Court Team and elected to the Order of the Coif, the law-school equivalent of Phi Beta Kappa. He practiced law with the Wall Street firm Sullivan & Cromwell and held executive positions with three Fortune 500 companies before founding his firm, Terry Cooper Political Research, in 1982. Terry has taught opposition research at the Republican National Committee’s Campaign Management Colleges, at American University’s Campaign Management Institute, at George Washington University’s Graduate School of Political Management, at the University of Florida and at training programs sponsored by the state Republican parties of Virginia, Delaware, Illinois, Michigan, Tennessee, Wisconsin and Washington State. Leigh Middleditch is a vice president with McGuireWoods Consulting where his practice is now concentrated in the nongovernmental and exempt organizations fields. Leigh has previously served on the Board of Visitors and as the legal adviser to UVa and was a founder of the Sorensen Institute for Political Leadership. He also held the position of university lecturer in the Law and Darden Graduate Business Schools and is co-author of Virginia Civil Procedure. Leigh has been chair of the University’s Health Services Foundation; Virginia Health Care Foundation; Charlottesville-Albemarle Chamber of Commerce; Virginia Chamber of Commerce; Senior Lawyers Division of the American Bar Association, and a member of the ABA Board of Governors. He has also served as a director of the United States Chamber of Commerce; trustee of the Thomas Jefferson Foundation (Monticello); and University of Virginia Law Association. He currently is on the Board of the Montpelier Foundation; the U.Va. White Burkett Miller Council and Foundation for the Study of the Presidency; and is a Trustee of the Claude Moore Charitable Foundation. Leigh served on active duty with the United States Navy from 1951-1954 and retired as a Captain USNR. 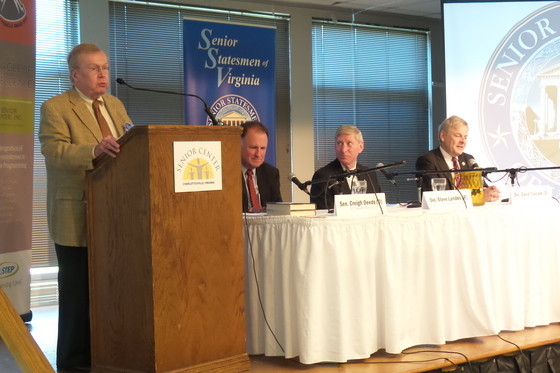 Middleditch and Cooper spoke at the Wednesday, June 11, 2014 meeting of the Senior Statesmen of Virginia. The meeting was held at the Senior Center in Charlottesville. Following the presentation, questions were taken from the audience. The program was moderated by SSV President Bob McGrath. Terry Cooper, owner of Terry Cooper Political Research, addressed many of the hot-button issues dominating politics today. Mr. Cooper does political research, principally opposition research for Republican candidates. He is a member of the Senior Statesmen of Virginia. Terry is a graduate of Episcopal High School, Princeton University and the University of Virginia School of Law, where he was Research Editor of the Virginia Law Review, a member of the National Moot Court Team and elected to the Order of the Coif, the law-school equivalent of Phi Beta Kappa. He practiced law with the Wall Street firm Sullivan & Cromwell and held executive positions with three Fortune 500 companies before founding his firm, Terry Cooper Political Research, in 1982. Terry has taught opposition research at the Republican National Committee’s Campaign Management Colleges, at American University’s Campaign Management Institute, at George Washington University’s Graduate School of Political Management, at the University of Florida and at training programs sponsored by the state Republican parties of Virginia, Delaware, Illinois, Michigan, Tennessee, Wisconsin and Washington State. Terry’s clients have included then-Speaker of the U.S. House Newt Gingrich (R-GA); then- Congressmen Tom Davis (R-VA), Nancy Johnson (R-CT), Jim Greenwood (R-PA), Chip Pickering (R-MS) and Jim Nussle (R-IA); Congressmen Tom Latham (R-IA), Denny Rehberg (R-MT) and Doc Hastings (R-WA); then-Virginia Attorney General Bob McDonnell; and a number of members of the Virginia and Florida legislatures. Terry Cooper Political Research is located at 1111 Timber Trail Drive, Charlottesville, Virginia 22901. Terry can be reached via telephone at (434) 202-8065. 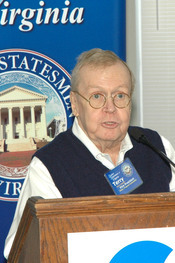 Mr. Cooper spoke at the Wednesday, June 13, 2012 meeting of the Senior Statesmen of Virginia. The meeting was held at the Senior Center in Charlottesville. Following the presentation, questions were taken from the audience. The program was moderated by SSV Vice President Bob McGrath.